Some things just shouldn't be done, like converting a World War II era Douglas DC-3 airplane's engine from its original twin multi-cylinder radials to jet-engine-powered turboprops; it violates nature's rules. Another example might be installing a digital speedometer in a vintage pickup truck. 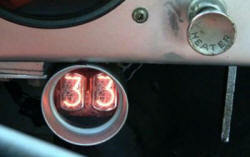 I say 'might' because thanks to Luke Miller's ingenuity, his 1953 International pickup truck - indeed the world - now has a proven plan for a GPS-driven, two-digit speedometer featuring a Nixie tube numerical display. A two-part article on the EE Times website provides the theory of operation and the details for constructing the Nixie tube speedometer. Why GPS-driven, you might ask? It was evidently simpler - and more impressive - to do so than to tap into the truck's speedometer cable and implement a sensor. An added benefit is portability. This looks like a Kickstarter opportunity for commercial productization if there ever was one. 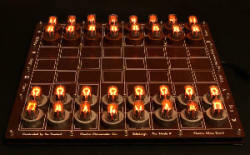 In other Nixie tube news, the Nixie Chessboard DIY kit is now available for sale just in time for Christmas! 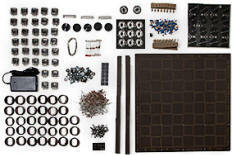 The price is $399, a mere pittance of a sum when you consider it includes 32 Nixie tubes and all the required parts, even the 12V power supply. Unfortunately, if you want give it as a gift, you'll have to wrap a promise for delivery in 2014 because its popularity has caused a stock depletion.